Worldwide, the concept of Environmental Education (EE) is becoming more and more significant and more and more relevant. As populations soar to unprecedented heights and resources remain finite, so the world has realised and accepted the challenge of learning to become sustainable in its approach to basic resources. Schools, therefore, need to tackle the important challenge of teaching E.E in a way that is going to equip future decision-makers with the necessary understandings and insights into the all important question of sustainable development. The overall aim of E.E at Grantleigh is geared towards developing an ongoing programme that integrates E.E into the Grantleigh learning experience in an inclusive and holistic way so that no pupil leaves our school without having benefited from our endeavours in this regard. Grantleigh has joined the Eco-Schools Programme, an international programme that operates in more than 37 countries around the world and is designed to encourage curriculum-based actions for a healthy environment. This also provides for membership of the Wildlife and Environmental Society of South Africa. 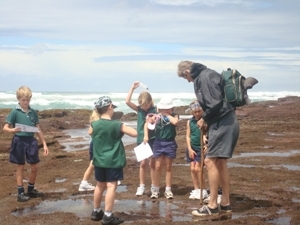 Some of the activities that are undertaken and which lead towards an awarenenss of the pressing environmental issues include: learning programmes with an environmental theme, comprehension and writing activities, energy audits, wetland studies, visits to cultural heritage sites, visits to game and nature reserves, slide-show, talks, etc. The school's efforts in Environmental Education resulted in it being awarded 'Green Flag' status in 2012 and 'International Green Flag' status in 2016. This interest group provides opportunity for pupils to be exposed to a wide variety of environmental issues and experiences from planting indigenous gardens in the school to excursions into the surrounding area. Our geographic location lends itself to very interesting excursions and learning opportunities. We consider a first rate education as being incomplete without thorough awareness of the important environmental issues and challenges that the future holds and, as a school, we will work steadily towards attainment of this holistic goal.